Exclusive offer - Get up to 15% off! Get your Christmas shopping sorted from the comfort of your home and save money at the same time, with our exciting 3 tiered offer! To take advantage of these fantastic offers, simply add your chosen product/s to your basket and enter the relevant offer code. For 5% off orders over £20 enter offer code: CFBF5 at checkout. For 10% off orders over £50 enter offer code: CFBF10 at checkout. 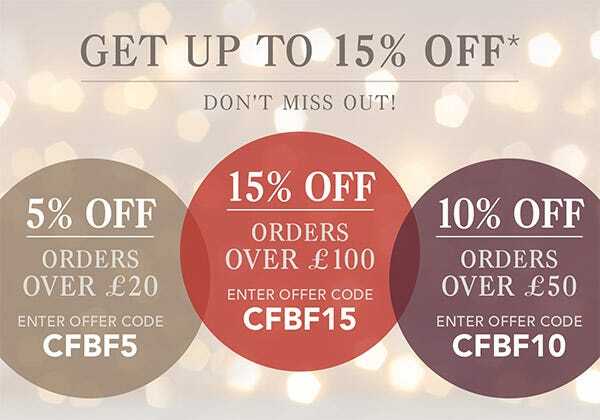 For 15% off orders over £100 enter offer code: CFBF15 at checkout. 15% off all orders over £100: To redeem this offer, simply add any item/s worth £100 or more (excluding delivery cost) to your basket and enter the offer code CFBF15 when prompted. 15% will automatically be deducted from your order. 10% off all orders over £50: To redeem this offer, simply add any item/s worth £50 or more (excluding delivery cost) to your basket and enter the offer code CFBF10 when prompted. 10% will automatically be deducted from your order. 5% off all orders over £20: To redeem this offer, simply add any item/s worth £20 or more (excluding delivery cost) to your basket and enter the offer code CFBF5 when prompted. 5% will automatically be deducted from your order. All offers: These offers expire at 11.59pm on Monday 26th November 2018. Minimum spend excludes delivery cost. Cannot be used in conjunction with any other offer. Offer only applies to in-stock items. We reserve the right to withdraw this offer at any time.